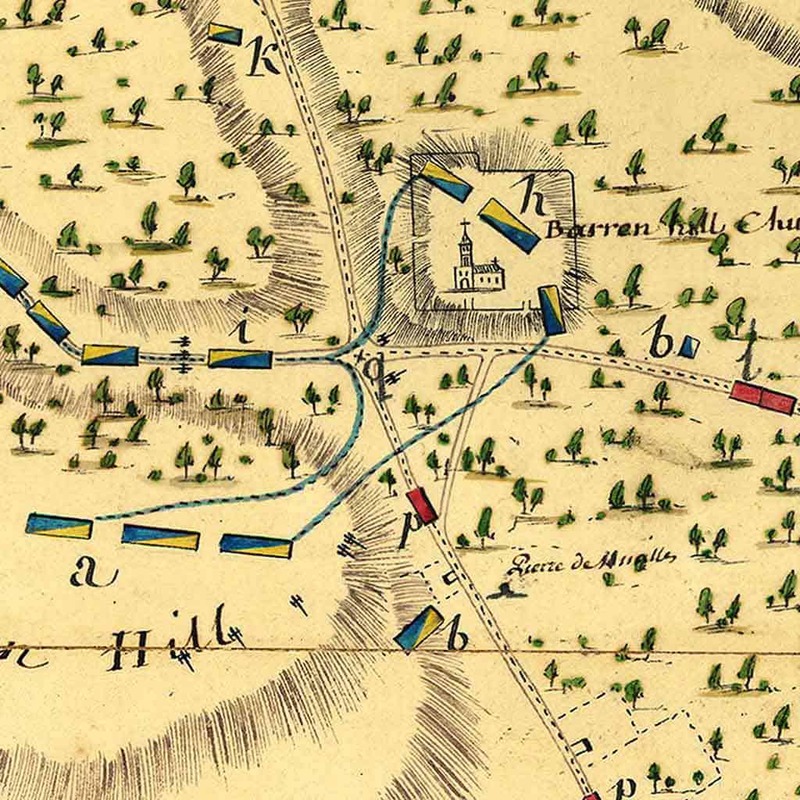 The Battle of Barren Hill was a minor engagement during the Revolutionary War. A British force attempted to encircle a smaller Continental force. The maneuver failed, with the Continentals escaping the trap, but the British took the field. Armies - American Forces was commanded by Maj. Gen. Marquis de Lafayette and consisted of about 2,200 Soldiers. British Forces was commanded by Maj. Gen. James Grant and consisted of about 16,000 Soldiers. Casualties - American casualties were estimated to be 3 killed or wounded. British casualties were unknown. Contemplating the contingency of an early withdrawal by the British from occupied Philadelphia, General George Washington sent Major General Marquis de Lafayette to Barren Hill (about halfway between Valley Forge and Philadelphia) to reconnoiter British intentions, as well as to interdict British detachments foraging for food in the surrounding countryside. 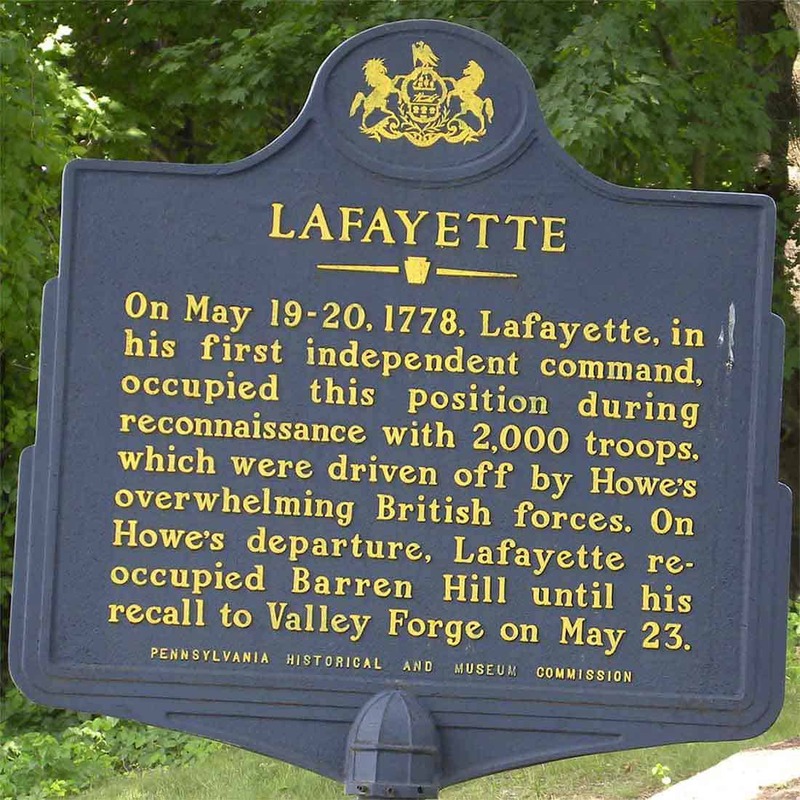 On May 18, Lafayette left the Valley Forge camp with 2,100 troops and five pieces of artillery. 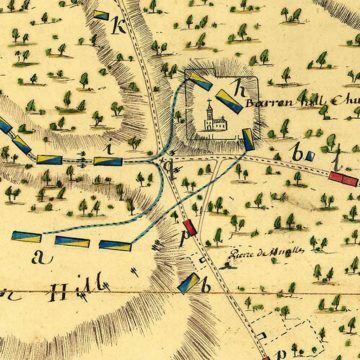 After crossing the Schuylkill River and turning south, he took up position at Barren Hill, which was close to Matson's Ford. A brigade and the guns were posted on the high ground, near a church, facing south. Another posting was at the Ridge Road to the south, and the Pennsylvania militia was sent to guard the road that led west from White Marsh. The British quickly discovered that the American force was nearby and decided to attack and seek its destruction. 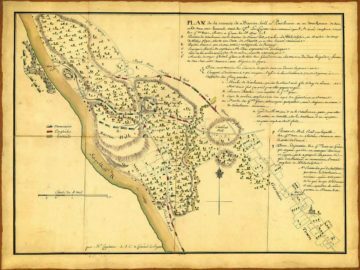 On May 19, around 10:30 PM, Major General James Grant and a 5,000-man British force, including 15 guns, was sent toward Barren Hill. The plan was to take a circuitous route leading to the junction of White Marsh Road and Ridge Road. This would cut off any avenue of retreat for the Americans. A body of 2,000 grenadiers and dragoons would then move along Lafayette's left flank while another group would move into position on the American right. The plan would result in the American position being encircled from three positions, trapping them against the river. The British force was to wait until morning to attack and destroy or capture the entire American force. General William Howe, commander of the British forces at Philadelphia, was so sure of a British victory, that he had a big dinner planned for the night of May 20 to celebrate Grant's victory and to meet Lafayette in person. On May 20, the British launched their attack. The militia scattered at the sight of the British troops, not offering any resistance and failing to notify Lafayette of the attack. On Ridge Road, the American group learned of the British attack. A small group was sent to fight a delaying action against the British while their commander sent word to lafayette about the developments. After Lafayette learned of the attack, another Patriot came up and told him of the British advance up White Marsh Road. 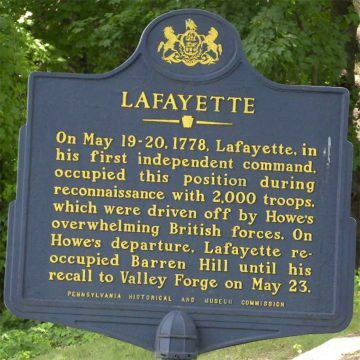 Lafayette knew of another small road that led back to Matson's Ford that would bypass the British force. It ran along some lowground that would conceal the Americans from the British. The British did not know about this road. Lafayette ordered his men to retreat down this road while ordering a rear guard to delay the British at the church. A few small patrols were sent to engage the British, making them think that the American force was wanting to stay and fight it out. Lafayette calmed down his retreating force and slipped away with relatively few casualties. 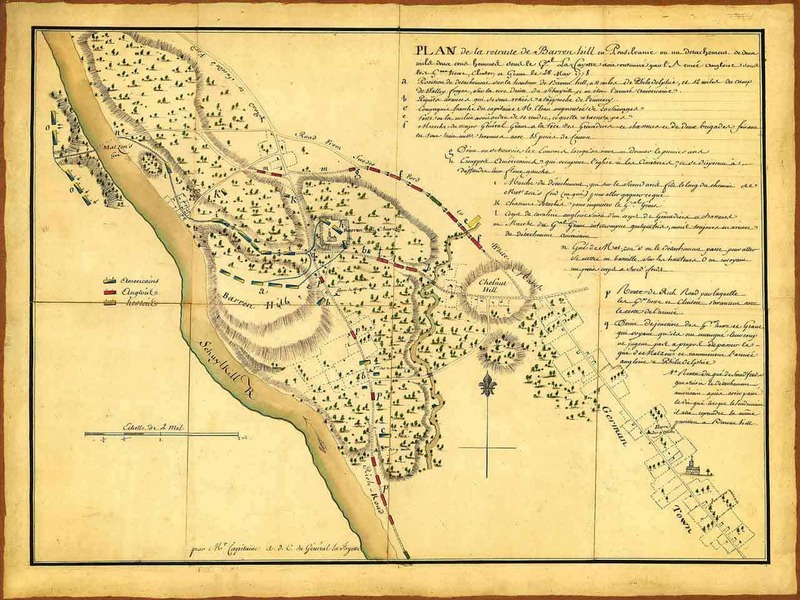 The British, having failed to capture Lafayette, resumed their retreat from Philadelphia to New York. Washington's army shadowed Clinton on his withdrawal and forced a battle at Monmouth on June 28, the last major battle in the North.